There once was a gardener named Cyril Benson who felt passionate about beautiful outdoor spaces. He was knowledgeable about plants of all sorts having worked at the Experimental Farm in Ottawa and the Fletcher Wildlife Garden. Cyril died a few years ago and his memory lives on through the garden. He knew of an opportunity through the City of Ottawa to apply for funding to enhance beauty in the city. Through Mt Calvary Lutheran Church, the outreach committee at the time worked with him to apply for funding. The application was successful and the garden developed based on Cyril’s skills and knowledge. Records have been kept of the location of the plants in the garden and their care requirements. Why have a garden, and what is our garden’s intent? 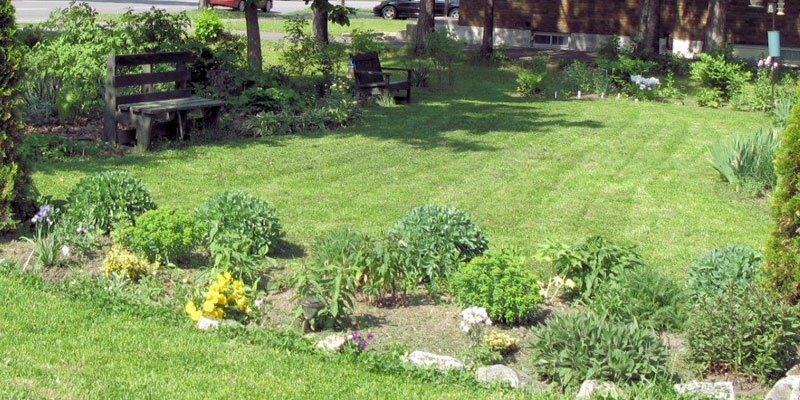 Our garden is a form of outreach to the neighborhood, a quiet place where dog-walkers can meander, parents with young children come for some space to walk and play, people walking to the mall for groceries pause to rest or meditate. Some garden visitors come to pray and to meet someone. Spending time in the garden has created opportunities to meet and converse with our neighbors, and provide something to the neighborhood. People have commented that they identify the church with the garden and many positive comments have been received. The garden is always in need of tending through spring, summer and fall. Come out on Saturdays to join the group that gardens together. Saturday mornings , approximately 9-11 seemed to work best in previous years. Bring your favorite brown beverage and a snack, a sunhat and gloves, and pitch in (weather permitting)! Our garden is maintained through collaborative teamwork. If you have an area of expertise, please share. Each year the weekend after the May long weekend (or earlier if the ground is dry enough) we start by cleaning up the property, picking up garbage and raking the grass. From then on, the hoeing, weed-pulling and watering are done as needed (pretty much weekly). Our labyrinth is at the far end of the green space, away from the street. When the ground is dry enough to walk on it, take a stroll through. It will need some maintenance as well, to pull or discourage weeds and ensure the grass stays green and the bricks visible. It was intended to be low maintenance, but does need some attention through the summer and fall. When you walk the labyrinth, think of people you want to pray for and consider how the twists and turns parallel our life journey. You are welcome to come out to help with the garden or labyrinth. Contact Marianne Thornton at marthornton@rogers.com if you have any questions.